The Kids Are Alright. In Fact, They're Knitting and Baking Bread! What’s going on with the youth these days? Some are getting into knitting sweaters. Others are tending to backyard chicken coops. They are cheesemaking, canning, beekeeping and growing their own vegetables. These labor-intensive homemaking projects may be more than a trend towards rustic pleasures. Emily Matchar calls this movement the New Domesticity. And she documents the phenomenon in her new book, "Homeward Bound: Why Women are Embracing the New Domesticity." Generally, she is not writing about people who embrace DIY culture out of financial necessity, but rather as a voluntary lifestyle. But Matchar notes that these young crafters and farmers are turning towards homemaking for different reasons than their predecessors. “They’re embracing it because of environmental reasons. They’re embracing it because they want to be less dependent on big corporations. Because they embrace the DIY lifestyle,” Matchar said. On the extreme end of the DIY movement, Emily Matchar looked at home schoolers and vaccination opponents. She believes that the New Domesticity is propelled by distrust in government and institutions, which on the extreme end almost resembles Tea Party libertarians. “It comes from distrust of big food. I think that’s a huge part of it. People not trusting where their food comes from. Wanting to know where it comes from. Not wanting to buy it from factory farms. All the way to people not trusting schools. Feeling like [schools] are going to squelch their children’s creativity. All the way through to people not trusting modern medicine," said Matchar. In contrast to today’s New Domesticity movement, the progressive movement from a century ago focused on increasing regulations. Mandatory public schooling and public vaccination programs were instituted. The Food and Drug Act protected consumers from adulterated food. “Now, people who define themselves as progressives, define themselves in large part by skepticism,” she said. 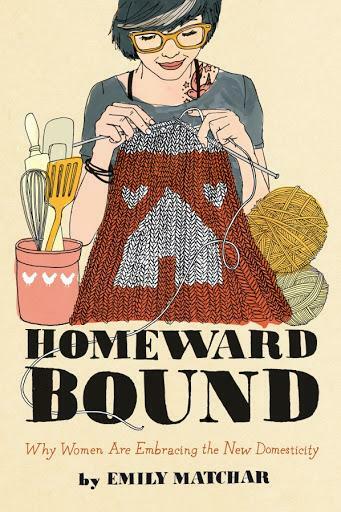 Author Emily Matchar joins host Frank Stasio to discuss her new book, "Homeward Bound: Why Women are Embracing the New Domesticity"
You may have noticed a DIY trend among young people these days. Some are getting into knitting sweaters; others are keeping backyard chicken coups. Otherwise, they are making cheese, canning, beekeeping and growing their own vegetables. These labor-intensive homemaking projects may not be just a trend towards rustic pleasures. Emily Matchar calls this movement the New Domesticity. And she documents this phenomenon in her new book, "Homeward Bound: Why Women are Embracing the New Domesticity." Generally, she is writing not about people who embrace DIY culture out of necessity, but rather as a voluntary lifestyle.